The Oxford Philharmonic Orchestra is a professional orchestra in Oxford founded in 2002 by conductor Marios Papadopoulos. It was originally called the Oxford Philomusica and has recently changed its name to the Oxford Philharmonic. I recently met up with Marios Papadopoulos to talk about the orchestra and learn more of their plans. Marios explained that the name change partly reflected the orchestra's greater global reach and that agents in the USA and Germany found the original name tricky and it reflects the orchestra's widening activities. Though Marios wryly commented that many people will not notice and the orchestra gets referred to as the Oxford Philharmonic anyway! 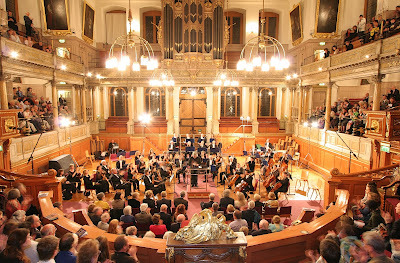 The orchestra is based in Oxford and has very much a regional base serving the city and the Thames Valley where the other nearest professional orchestras are in London, Birmingham and Bournemouth They give around 40 concerts per year, with half in Oxford. Marios feels this probably is the maximum that the city can absorb. For the rest, the orchestra travels and they have concerts coming up at London's Cadogan Hall and the Barbican, and perform regularly in Bristol, Cheltenham and Aylesbury. There are also some foreign tours in the pipeline. Many of the players are London-based freelance players, and there is a core of regulars and Marios feels that the orchestra has a very distinct identity. And as there is no other professional performing group like it in Oxford certainly helps when selecting programmes. Marios has a good admin team to help run the orchestra, but in the early days he did a great deal of the work himself to get the orchestra started. Whilst many cities have concert halls, only Oxford has the Sheldonian. Part of the orchestra's identity is its regular concert series in the Sheldonian Theatre, a wonderful historic venue. It is quite an intimate space, for Marios it offers a unique experience for both the audience and the performers. He feels the venue has lovely acoustics, though it works better for a smaller ensemble but can accommodate up to 80 players. There have been calls for Oxford to have a custom built concert hall, but Marios thinks that this is missing the point; whilst many cities have concert halls, only Oxford has the Sheldonian. The orchestra has been able to form some strong artistic partnerships as performers come to Oxford and enjoy performing there and want to do more. Maxim Vengerov is the orchestra's artist in residence, and he is performing with them in Oxford and London this season. Their recording of the Brahms Violin Concerto is forthcoming and they have just recorded the Sibelius Violin Concerto in its original 1904 version. The orchestra also has an ongoing relationship with Andras Schiff; Vladimir Ashkenazy came last year for two concerts and is enthusiastic about doing more and possibly recording with them; Nigel Kennedy will be returning in 2016 to tour with the orchestra. Marios sees such relationships as opening new horizons and new doors. Because of the Sheldonian's size, income from ticket sales is limited even though they sell out. 300 of the 800 seats are at the very top and are offered to students for £5. Marios is very grateful for the fact that artists do discount their fees, but the remaining funding has to be raised privately from individuals, trusts and corporations. They get a small a amount from the city council, but nothing from the Arts Council and no money from the University despite being in residence there. The orchestra has large education and community initiatives involving everything from primary schools to those in tertiary eduction, as well as links to community youth orchestras. The orchestra's programmes for their residency at the university complement what the Faculty of Music offers as there are not performance related studies. So the orchestra runs an apprenticeships scheme, selecting a group of students to play in the ranks guided by the professional members of the orchestra. There is also an annual composers workshop with Robert Saxton selecting a work for performance by the orchestra. Marios comments that it is important for composers to hear their works performed by a real orchestra rather than just in Sibelius. They also run a lot of masterclasses and have given them with Lang Lang, Maxim Vengervo, Valery Gergiev and Ann Sophi Mutter which represents an ongoing opportunity for the students. There is also a lot of community work, family concerts and working with deprived children. Many of these activites are run under the banner of the orchestra's Academy. This includes the Summer Piano Festival which is now very established and there are well over 100 applications for the 15 places. The festival involves the students in masterclasses, performance opportunities and concerts and participating pianists have included Byron Janis, Menham Pressler, Alfred Brendel, Barry Douglas and Andras Schiff. Marios feels that it is an amazing opportunity for students and Lang Lang's foundation sends two of their scholars. Originally a pianist, Marios does not play as much as he once did, but he is still active as a pianist and has given complete cycles of Mozart concertos and Beethoven concerts with his orchestra. His own recordings include Shostakovich's Twenty-four preludes and fugues, Stravinsky's Concerto (which Marios says is one of his favourite works) and Janacek's Capriccio and Rondo. He does recitals with Maxim Vengerov and the two are recording the Brahms sonatas and they will be touring next year to Vienna, Madrid and the Teatro Colon to co-incide with the CD release. Forthcoming concerts which Marios looks forward to include Richard Strauss's Four Last Songs with Renee Fleming which he feels has to be something to revere. And he loves that Pinchas Zuckerman will be performing Beethoven with the orchestra (even though Marios himself is not involved in the concert. Marios and the orchestra will be performing Brahms's Violin Concerto with Maxim Vengerov at the Cadogan Hall, and doing Sibelius's Violin Concerto at the Barbican. Vadim Repin will be performing Shostakovich's concerto. All the Schumann symphonies are included in their season with Marios conducting symphonies one, three and four. It is the first time he has conducted the symphonies and is fascinated to do so, having played so much of the composer's piano music and hopes to bring something of this piano experience to the symphonies. In May 2015 the orchestra joined with Metta Theatre to stage Mozart's Cosi fan tutte in a production which Marios found exciting and was well reviewed. They will be joining with Meta Theatre again in 2017 to stage La Boheme. Marios feels that the orchestra, because of its versatility, should be able to get into the pit. But he also feels that the orchestra needs to be on an equal footing with the other performers and his idea of staging opera with them is to elevate the orchestra's role in opera and he has ambitions to do opera every two years. The orchestra is planning as far ahead as the 2019-2020 season, including he Beethoven year and thee are some exciting collaborations to come. 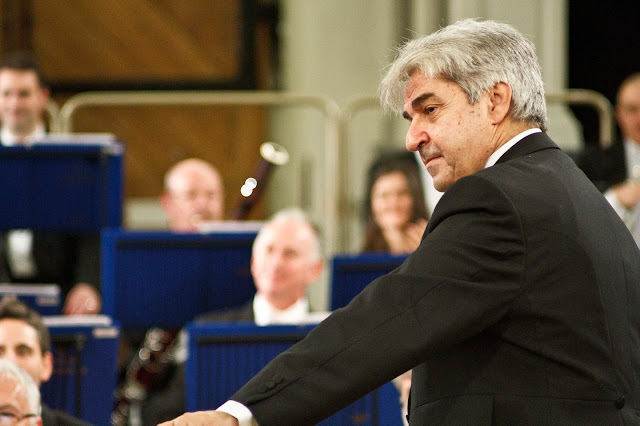 Marios feels that the orchestra has been eclipsed by the giants but is slowly gaining ground, and he hopes that people stand up and take note of some of the wonderful music making and a lot of this is to do with the versatility of the orchestra's players. Marios does not want the orchestra to be typecast, and they can scale up and down according to repertoire. Their programming includes baroque music and Bach, and they have a Baroque Festival, played on modern instruments but with period style. They also perform a lot of chamber music, both Marios and the orchestras principals. this means that they get to know each other and that this transfers to the full orchestra with a commonality of sound and style. At the other end of the spectrum, they commission music and work regularly with the composers from the faculty of music and they are very much embedded in musical life at Oxford.